When a book helps people to re-examine themselves and find clear insight and motivation to live more creative lives, it has to stay in print. Originally published as A Deeper Surrender: Notes on a Spiritual Life, I decided to change the title to a more befitting, A Lotus Flower in Muddy Waters. It struck me that every human being is like a lotus flower, every human being lives in muddy waters and has to find a connection to light and love and happiness in their lives. We weren’t born here to be miserable. Infants are sweet and cuddly and radiate joy. It’s a pleasure to hold them, to play with them, to allow their sweetness to be part of our lives. Somewhere along the way, that cuddliness disappears and we’re conditioned to believe that struggle and unhappiness is all life has to offer. It’s not true. Every one of us was born here to have a wonderful life. We just have to transform our suffering into love, our fear into joy, and develop inside ourselves the security to live with an open heart. 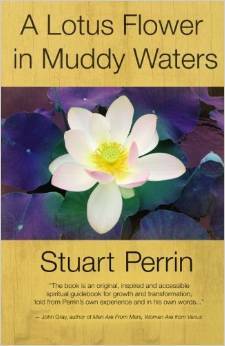 This timeless book, A Lotus Flower in Muddy Waters by Stuart Perrin, is one of the most important, revelatory, and generously written studies of its kind in contemporary spiritual literature — a twenty-first century guidebook for actualizing one’s inner life. It explores the practice of Kundalini Yoga’s therapeutic, spiritual and esoteric applications and is as relevant to modern day seekers as Sri Swami Yogananda’s Autobiography of a Yogi was to those who read it in the twentieth century. Author and teacher, Stuart Perrin, was born in New York City. As a child, he exhibited unusual spiritual gifts and sought to learn and understand the deepest teachings of eastern and western religions. After years of domestic and international travel in search of a guru, Mr. Perrin returned to his home in New York where he met Rudi (Swami Rudrananda). Thus began his initiation into what would become a lifetime of personal growth that culminated in mastery of Kundalini Yoga and the ability to pass on teachings, techniques and benefits of the spiritual practice he originally learned from Rudi. “A Lotus Flower in Muddy Waters” shares with the reader profound and ageless teachings. Mr. Perrin gives us a clear and practical understanding of how one can live a happy life in a confused and crazy world. A perennial storyteller, he uses uncomplicated language to share his personal experiences on the spiritual path. Do yourself a favor! Read this book!